Most of the 1,602 crowd who arrived at Stark's Park, Kirkcaldy, expected to see their side Raith Rovers celebrate their Ramsden Cup triumph the previous weekend with a comfortable league victory over Dumbarton. But it was not to be. Most of the 1,602 crowd who arrived at Stark's Park, Kirkcaldy, expected to see their side Raith Rovers celebrate their Ramsden Cup triumph the previous weekend — when they beat Rangers 1-0 to take the silverware — with a comfortable league victory over Dumbarton. But it was not to be. Ian Murray's men not only spoilt the party with a comfortable 3-1 victory, but also made sure of avoiding the relegation play-offs and kept alive their hopes of reaching the promotion play-offs by drawing level with fourth-placed Queen of the South whom they play next Saturday. The first half was nearly all Dumbarton as they produced some fine attacking football. Mark Gilhaney cut in the from the wing and opened the scoring with a low shot, and minutes later Mitch Megginson cut in from the other wing and did the same thing for no.2. Rovers had their attacking moments, and keeper Jamie Ewings had to produce good saves. After the break the home side remained on the attack, playing towards the vociferous home fans. However Sons came back into the game with goal no.3. Mark Gilhaney fired in a shot which was going wide until Colin Nish stuck out a foot and directed it past the keeper. Rovers had defender Dougie Hill red-carded for holding back Garry Fleming who was in a goal-scoring position, but they did claim a consolation goal through Gordon Smith with a fine angled lob. 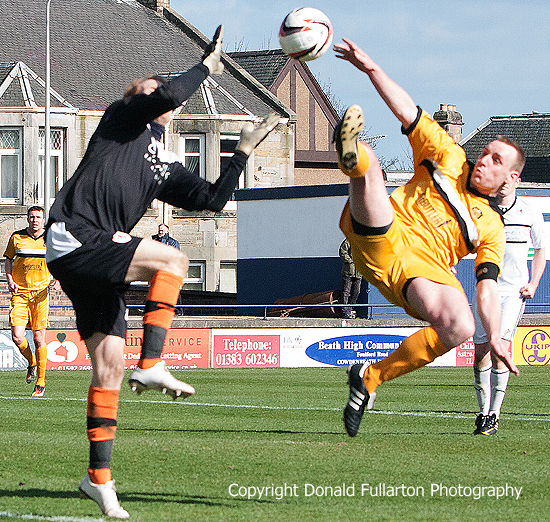 The picture shows Sons skipper Andy Graham tangling with the Raith keeper.